Qahtahna (Katana) is an extremely intense male from our first Radimir x Tora litter. He is currently working patrol, tracking / trailing (certified at 26+ hours) and human remains detection with the Roane County Sheriff's Office. He is always "on", is lightening fast and extremely agile. He has a rock solid disposition and is quite social. Trident is from our first amazing Dare x Rogue combination. He is certified in human remains detection compliant with the proposed criteria of NIMS Canine Search and Rescue Team-Land Cadaver Air Scent Type III. He is social, not dog aggressive and super biddable. Mattis is co-owned with Connie Hunter, and lives with Connie and family who also has his Aunt Chiyoh (Dare x Rogue). He is from our 2017 Trident x Phox litter and is another big bold puppy. Mattis has a take on the world attitude and doesn't back down from anything. Phox has turned out to be a phenomenal dog, bold, extremely athletic, incredible nose and non stop willing to please! She has a rock solid personality, and can go from social to serious and back in the blink of an eye. Not to mention she is gorgeous! Kirana arrived from Love & Spirit Kennels, in Moscow, Russia on 12 July 16. We are absolutely thrilled to have this lovely girl become a part of our family. Thank you to Sergey Zhirkevich for entrusting us with her, for all your support, videos, and help in ensuring she arrived safely. Voyna is a big, bold puppy from our very long awaited Trident x Phox 2017 litter. We have high expectations this girl will be able to tackle anything we throw at her. Currently in training for human remains detection. Rogue is from our 2011 litter. She is a wonderful combination of her parents, drive, brains, and beauty! She has produced outstanding puppies with Dare. Their puppies have titled or certified in conformation, competitive obedience, herding, human remains detection, tracking / trailing, and some will be moving on to PSD work. Tora is a stunning refined female from Laura Fahrenkamp of De Vel Malinois. She is a natural at tracking and a very willing worker. She has produced beautiful, stable, drivey pups all with her happy willing to please personality. Tora is now retired and enjoying life running up and down the mountain. "Radimir" was a big powerful male with fierce devotion to his family, and the strong working drives of his parents (Funk x Kira). He adored kids, and thoroughly enjoyed demos and Kids Days with the Sheriff's Office. He was an absolute joy to work because he had such an intense desire to please. Rad was certified in human remains detection compliant with the proposed criteria of NIMS Canine Search and Rescue Team-Land Cadaver Air Scent Type Other, Type III, NIMS Type I & II Canine Search and Rescue Team-Water Air Scent, NASAR HRD Disaster Type II, Area Search II, and Tracking / Trailing I (urban and wilderness at 24+ hours old). Funky was a highly accomplished, incredibly stable working dog. He retired from the Tennessee Special Response Team - A, and the Knoxville Volunteer Emergency Rescue Squad in area search and tracking / trailing on 04 July 2008. He passed along his great strength in character and drive to his pups who are now carrying on his legacy. Kira was a red sable medium female, who couldn't look innocent if she had tried. She was not the social butterfly her mother was, and did not readily accept strangers. She was a wonderful dog to work with though, very earger to please, super quick, and always a happy focused worker. She loved to track, and of course enjoyed all the bitework she could get. She was fearless when it came to going into things or through things. Inside she prefered to be in the kid's laps (trying to act innocent I'm sure). 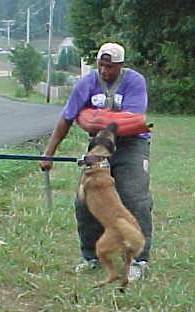 She was highly trained in personal protection including building sweeps, handler guard, vehicle protection, and silent guards. Kira peacefully crossed the Rainbow Bridge under a star filled sky on a beautiful calm night. I will forever miss my loyal "barracuda". We imported Fantome as a puppy from France, from Christophe Latour of “Maski du van Lappeenranta”. Fantome had a dynamite personality and a never ending willingness to please. He certified in human remains detection by the time he was a year old. 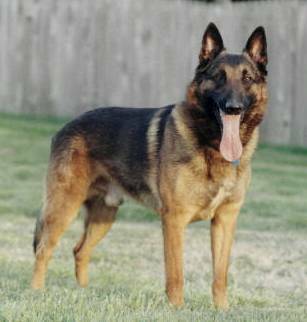 Unfortunately he was retired at 3 years old due to seizures and could not be used in our breeding program.